Click on this link to find out how you can get FREE lessons! E-Lanes Driver Training is an independant successful driving school managed by Elaine Smith. Elaine is a fully qualified female D.V.S.A. Approved Driving Instructor who is also PASS PLUS registered and a member of the M.S.A. (Motor Schools Association). 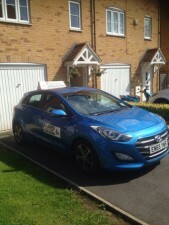 Teaching pupils for over 13 years including special needs pupils and training Driving Instructors. E-Lanes Driver Training provides a full range of structured driving lessons which have helped many pupils to achieve first time passes. E-Lanes Driver Training is an independant successful driving school which is managed by Elaine Smith. Elaine is a fully qualified female D.V.S.A. Approved Driving Instructor who is also PASS PLUS registered and a member of the M.S.A. (Motor Schools Association).